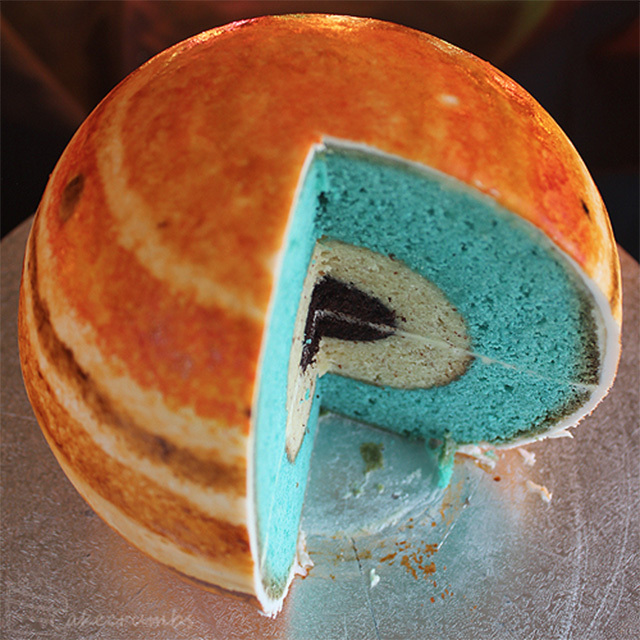 Self-taught chef Rhiannon over at Cakecrumbs has been working on a fun series of planetary cakes that are designed to be scientifically accurate with different types of cake representing various layers within Earth and Jupiter. For her Jupiter Cake the center is the theoretical rock/ice core (mudcake), followed by a layer of liquid metallic hydrogen (almond butter), and finally the liquid molecular hydrogen (colored vanilla). She layered her Earth Cake similarly and finished it off with some absurdly detailed continent design made with marshmallow fondant.